Self-care is one of those terms we hear more and more often these days. If we express frustration with something or feel too stressed out about something, someone will usually say “well what are you doing for self-care?”. The question is innocent enough but it is most of the time misused and misinterpreted. People will go on trips, go to the spa, get a hair cut, or do one of a million other things for self-care with the hope that a small escape from life will re-energize them. But those types of escapes and the happy feelings associated with them don’t usually last long. The reason for this is that those things don’t represent the true nature and value of self-care. Self-care is supposed to help you live your life, not have you escape it. True self-care allows you to live life and enjoy it. If you’re trying to use self-care to escape from your life, then it’s time to change your life with the power of appropriate self-care. 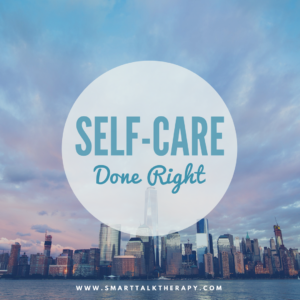 The image associated with this blog is a great example of true self-care. The point of self-care is to help you live and thrive in that bustling city; not try to escape it. Self-care, in it’s truest form, means doing things to improve your quality life. This could mean creating a savings account so that you can save enough money to not have to work the job that you hate. Or it could mean joining a cooking class that meets once a week so that you learn how to create healthy recipes for yourself while meeting new people. Or it could mean joining a book club to read stimulating books while engaging in social activities. Self-care could even means cleaning up your home so that it becomes a place that you actually want to live in and feel relaxed in. It could also mean saying good-bye to some toxic friendships while allowing new healthier friendships to form. Whatever self-care looks like for you, the main thing that you need to keep in mind is that it’s supposed to help improve your quality of life. We regularly use self-care in our work with clients and continue to accept new clients from Illinois (Chicago), California (Los Angeles, San Diego, Orange County, Santa Barbara, San Francisco, Sacramento), and outside of the USA (Canada, Australia, New Zealand, England, Ireland, Scotland, Wales, United Kingdom, Germany, France, Spain, Mexico).